Ask The Bellwether, online home of Amelia Garripoli, yarn poet. Productive Spindling (the book!) and The Bellwether Spindle in stock and shipping now. 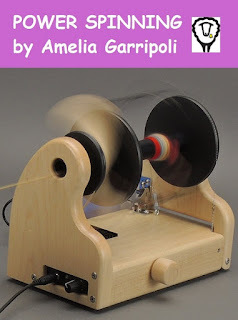 E-books galore: Power Spinning, Color in Spinning, Exotic Fiber on Spindles, and more! And, my videos! Yes, you heard it here! Videos, made with SpinOff - Supported Spindles and Turkish Spindles, on DVD or Digital Download from Interweave/F+W. The website features a top-3 list of posts over on the right. However, I have my favorite posts too. Currently I am enamored by Turkish Spindles, and love the economical colored-pencil spindle featured in How do you Make a Turkish Spindle?. I am also toying with the idea of narrow-form tapestry weaving, so "stay tuned", perhaps there will be a blog post on that this year (grin). In the Shop you can purchase my e-tutorials. If you can arrange to meet me at a show, I am happy to bring copies of my book, Productive Spindling, and my teaching top-whorl spindles, The Bellwether Spindle. Fiber fascinates me -- I spin, knit, nalbind, felt, dye, weave, crochet, knot, card, and play string games. Fiber combines texture, color, and design in wonderful ways. I teach and write about fiber: you will find the Blog full of useful fiber information with its FAQ style. Click Take a Workshop to see upcoming workshops. For a list of past venues and my publications, see the About page.